Three days into 2018, Coachella and Governor’s Ball have released their 2018 artists line-ups. Are y’all excited or could you care less? Happy New Year everyone! Three days into 2018, and two big name music festivals have released their artist line-ups for their spring and summer shows. Music festivals come and go, but two of the greatest festivals out there are Coachella and Governor’s Ball. Last year, she was pregnant with twins. This year she’s one of three major Coachella headliners. Beyoncé is back like she never left. Fresh off the heels of his latest album Revival, Eminem will headline The Governor’s Ball in addition to Coachella. The Weeknd will also join forces with Em and Bey at Coachella’s Empire Polo Club in Indio, California. Mark your calendars for April 13-15 and April 20-22. Check the full line-up below. 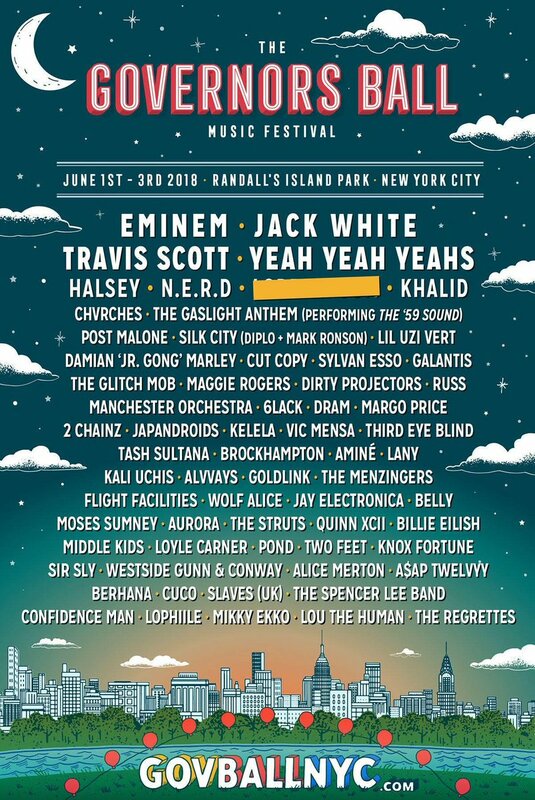 Returning to Randall’s Island Park in New York City, The Governors Ball Music Festival will be June 1st-3rd. Travis Scott is headlining while other notable artists include N.E.R.D., 2 Chainz,DRAM, BROCKHAMPTON, Khalid, and several others. The poster below details more Governor’s Ball artists. What does everyone think of the line-ups for both festivals? Let me know in the comments below! Eminem releases the Beyoncé-assisted track “Walk on Water” from his upcoming ninth album rumored to be titled “Revival”. Is the song HOT or not? Chime in the comments below! Eminem and Beyoncé team up for “Walk on Water”, a song ripped from Em’s upcoming ninth album rumored to be titled “Revival.” Just as a heads up, the song is more of a ballad than Eminem’s Trump-bashing fiery freestyle he released at this year’s BET Hip-Hop Awards. Sound off in the comments to let me know if the track is hot or not. Beyonce’s Wax Figure Still Has People Pressed! It’s no secret that Beyoncé is pretty much a big deal. She sneezes and literally the whole world will bless her. No shade. However, the shade was thrown heavily on the Internet on Wednesday (July 19th) when photos of a wax figure of Queen Bey was revealed. The wax figure, located in Madame Tussaud’s New York museum, received a slew of social media criticism after saying the statue looked whitewashed and didn’t capture the essence of the Queen. On a personal note, I remember going to Madame Tussaud’s in Orlando a year ago, and the wax statue I saw definitely had zero resemblance to Beyoncé. Unlike the Beyhive, I wasn’t particularly offended; however, the power of her fans is TOO REAL. Madame Tussaud’s New York has since replace the criticized wax figure and updated it with a better one. Peep the new statue here. Author chatmanjayPosted on July 22, 2017 July 22, 2017 Categories ICYMI (In Case You Missed It! ), News, Pop CultureTags Beyhive, Beyonce, Madame Tussaud, Queen Bee, wax figureLeave a comment on Beyonce’s Wax Figure Still Has People Pressed!